From the time he first set foot in South Florida as a teenage apprentice nearly a decade ago, Luis Saez’s humble, easy-going nature has contrasted with a competitiveness and talent that has seen him develop into one of the best jockeys in the country. Shy and soft-spoken off the track, the now 26-year-old Saez prefers to let his performance speak for him. Last winter at Gulfstream Park, Saez had plenty to say. Already one of only four riders to reach 100 wins during the elite Championship Meet, Saez established a single-season record of 137 victories – including a pair of seven-win days – while coasting to his second consecutive title. Starting with Saturday’s Opening Day program featuring the 20th edition of the $1.11 million Claiming Crown, being hosted by Gulfstream for the sixth straight year, the Panama native can join another exclusive club. Hall of Famer Javier Castellano, who won a record five in a row before being unseated by Saez in 2016-17, Jorge Chavez (1999-2001) and Jeff Fell (1977-79) are the only jockeys to lead Gulfstream’s jockey standings three consecutive years. Saez rode three winners his first day at the 2017-18 Championship Meet, setting a tone that would continue throughout the winter. He would register 39 days of two or more wins including seven on both Jan. 24 and March 29 to equal the standard set by Hall of Famer Jerry Bailey in 1996 and matched by Tyler Gaffalione in 2017. He also had a six-win day Dec. 20. Saez won nine stakes during the Championship Meet, three of them coming on Florida Derby (G1) Day – the Pan American (G2) with Hi Happy, the Gulfstream Park Oaks (G2) with Coach Rocks and the Sanibel Island with Figarella’s Queen. Among Saez’s other winter stakes wins were the Swale (G2) aboard Strike Power, the Sugar Swirl (G3) with Rich Mommy, the Fred Hooper (G3) atop Tommy Macho and the Gulfstream Park Sprint (G3) on Classic Rock. Saez’s 137 wins were five more than Castellano’s previous mark set in 2013-14, and 36 better than runner-up Irad Ortiz Jr. His $5,776,741 in purse earnings ranked second behind Florent Geroux, whose victory on Horse of the Year Gun Runner in the $16 million Pegasus World Cup Invitational (G1) was worth $7 million. His success at Gulfstream served as a springboard to a 2018 season that has seen Saez surpass $16 million in purse earnings for the first time while winning at least 200 races for the fourth straight time and sixth in 10 full years riding in the U.S. He won his 2,000th career race Nov. 9 aboard Y’allcomenow at Aqueduct. 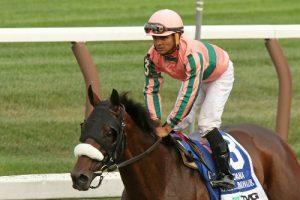 Jockey Luis Saez came to the U.S. in 2009 and was a finalist for that year’s Eclipse Award as leading apprentice. He has won 75 career graded-stakes and purses approaching $95 million, rising to national prominence as the regular rider of Will Take Charge, the champion 3-year-old male of 2013. Once again, Gulfstream’s Championship Meet jockey colony will include the best collection of racing’s top riders including Castellano, fellow Hall of Famer John Velazquez, Ortiz and his younger brother Jose Ortiz, Gaffalione, Julien Leparoux, Paco Lopez and Edgard Zayas. Saez is looking forward to the challenge.